Next articleA Zambian specialised business advisory and capital raising firm scoops two International awards. Is double H normal mwebantu. I wonder if double is normal. PF can’t survive without violence & intimidation. That’s why their symbol is a fist and that’s why Sata named it PF after Zimbabwe’s brutal oppressive ZANU-PF. Sata started the recruitment of thousands of brutal PF cadres in ZP. but HH should try not to be too dull to give them an excuse. God will fight your battles, can Kampyango arrest bees? No he can’t so why stress yourself you dull chap! UPND should arm themselves. All citizens should arm themselves since the police are so compromised. This is the only option for self defense. What shameful party this PF is. They couldn’t tear gas bees, but want to use on people? 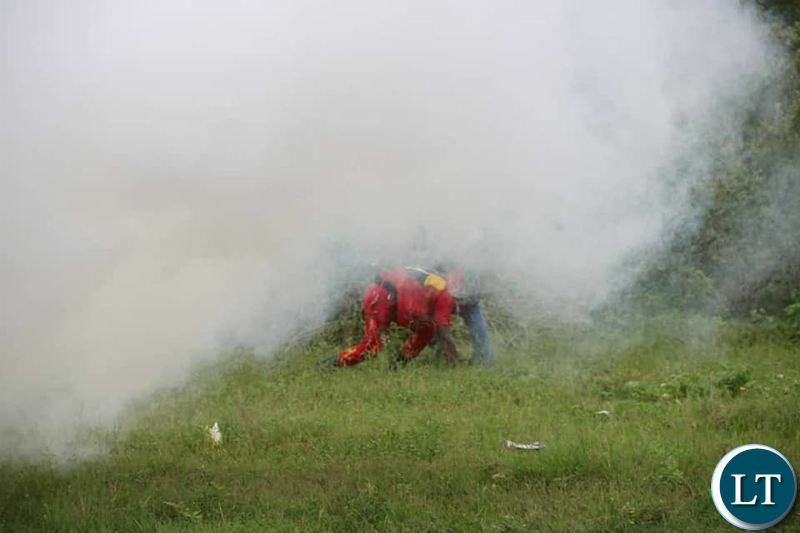 Tear-gas on swam of bees would have been more effective than prayers PF are asking for. 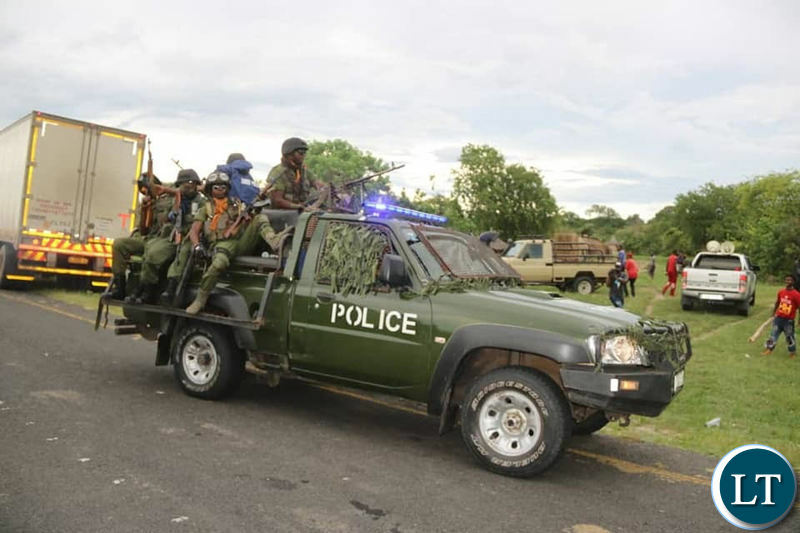 Police Officers ambush a UPND rally in Sesheke. How do you photograph UPNDEAD cadres and say Police Officers ambush a UPND rally in Sesheke? This man is spectacularly delusional. If Lungu wanted to kill you, you wouldn’t see it coming! @Hurry—It is a pity you were born a human being. Your thinking is that of an animal. 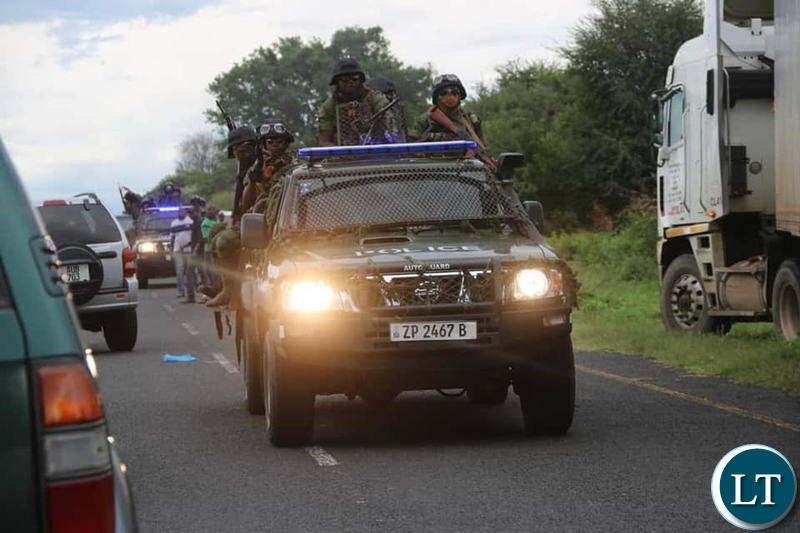 How come the live bullets missed everyone if the police fire them in the cloud of upnd. Abufi bwine ubu. How can six different pictures have one caption? Bunangani??? @Wajimona—Do you think that you are a human being?. If you are, then your brain is full of tuzhi. Your thinking is that of a typical animal. HH should start counting how many lives are remaining. He seems to have 9 lives like a cat. This Masonist after being chased from the Mining Indaba in South Africa, he now wants to bring confusion, he knows he’s a loser. Stupid ***** people instead of discourage pf party is doing hurry and wajimona you are busy praising butch of criminals.stop using your stomach when we are in such situations you ???? HH is an alarmist and attention seeker!! !Kainde’s desperation for plot one is now getting out of hand.HH knew 100% that president Edgar Lungu will be in Sesheke today just for a 1 day campaign,so why did he wait and go there tomorrow?HH has camped in Sesheke while ECL only went there today.Am pretty sure that HH and his tribal cadres wanted to embarrass the president but ZP cant allow that.ZP have to protect the president at all cost.If HH wont change his evil ways of doing politics,he will die for nothing and NOBODY IN ZAMBIA SHALL EVER PROTEST OVER HIS DEATH(God forbid).ALL WHAT ZAMBIANS SHALL SAY IS “RIP HH”. Another animal dressed in a human body. Why does Zambia have people like you? They can be 3 seats apart at the cathedral but they cannot be miles away from each other in sesheke? What kind of ignorance is that? They are firing live bullets at us. Wait a minute, let me first post on my Facebook page, done. Now let me run, they want to kill me. Hey are you a Satanist? Hey are you a Satanist? I mean you Mina? Cursed is the day HH joined local politics on tribalines in 2006!! !If not caged,HH may set mother Zambia on fire! 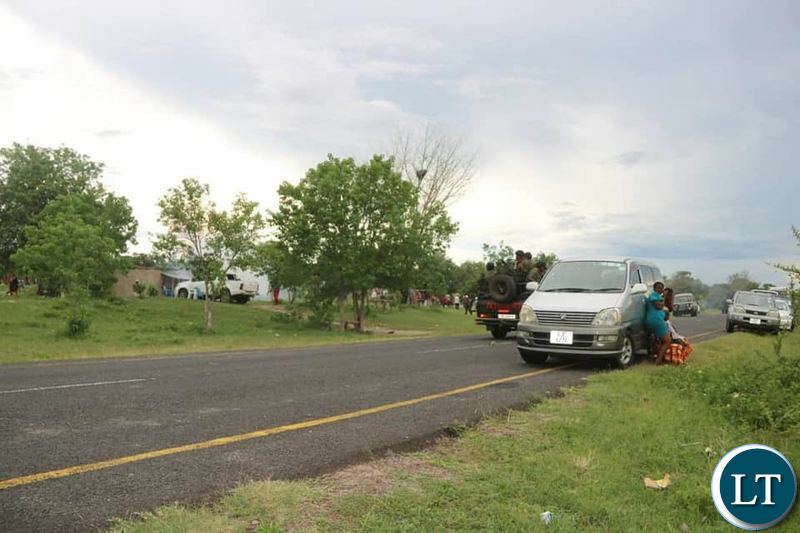 !It is common sense that ECL and HH cant campaign in a small town such as Sesheke on the same day.Sesheke is not Lusaka or Ndola or Kitwe.It is a terribly small rural town with only one major (tarred road).Therefore,this was a deliberate move by HH to seek sympathy from Zambians BUT HE GOT ZERO SYMPATHY FROM US!! !Well done ZP as the presidency is bigger than anyone in Zambia.HH IS BIG HEADED,SO YOU DID A SPLEANDID JOB BY TEAR GASING HIM.NEXT TIME USE LIVE BULLETS SO THAT THIS F0OL CAN START RESPECTING THE OFFICE OF THE PRESIDENT!!! UPND preparing for another loss that is what this is. The always do this when they are losing in strongholds. Vote FDD. If they were live bullets, how come he is still throwing some poop? What does HH want kanshi? Up to this day, the chap cant respect the Head of State, he is possessed. This really makes a sad reading…..what`s up mother Zambia? How can any normal thinking person, honestly, condone such abusive use of power? Even if you hate HH, you can’t say yes to such police behavior. HH is a dangerous man Zambia has ever had.The man is TOO BITTER. It’s sad that majority Zambians doesn’t know him and what He stand for. THE MAJORITY UNDERSTAND HIM AS A LOSER BUT HIS CADRES PUFF HIM AND MAKE HIM BIG-HEADED. THAT IS WHY HE KEEPS ON LOSING ELECTIONS. Liar, time General C.Tembo went to Solwezi Mwanawasa was there and Tembos aeroplane was refused landing at Kasompe airstrip. We were waiting for him only to be told that the MMD presidential candidate was inNWP so no other party would be allowed. Don’t just imagine things. Ask Double K how man Chilu fired live bullets on the big man. Here is the real characterization. The UPNDEAD cadres ALWAYS want to do running battles with Police. They pull up arrogant stunts with law enforcers while others are fillming wrong scenes. You are another animal with a human body. Every Rally requires a police permit or else they break it up. Every gunshot is not a live bullet but a blank or rubber bullet meant to scare offenders. At the end of a live bullet is blood or a dead body. At the end of a blank or rubber bullet is injured egos and a fear of shadows. Only uncivilized baboons can just shrug off what is happening. … replete with such treatment of other human beings as the cause of consequent civil strife and wars. Some of the comments here, trying to defend the indefensible, are nauseating. Even toddlers know that there has never been any level playing field allowed in relation to the opposition. So what if ECL is in the area? What a ridiculous ‘justification’ to persecute others who want to peacefully campaign for their candidates. Pathetic how in this time and age people will side with thuggery in the disguise of governance and leadership. Unfortunately ba Harold, one would expect you that there are privileges of incumbency anywhere on earth. The arrogance of your HH is so high that he thinks that he is equal to ECL right now – wrong, it is dangerous to be that s.tupid. HAROLD HAKAINDE, YOU’RE VERY REPULSIVE! CONTINUE BEING A GLUTTON ABROAD WHILE WE’RE FAST IMPROVING OUR DEMOCRACY AND OUR ECONOMY. YOUR NAUSEATING POSTS DON’T COUNT TO US, PEOPLE ON THE GROUND. This country has really gone to the thugs. It seems people are so full of hatred for HH that they are failing to see the ugly truth about their PF party. Police are no longer working professionally but following orders from thugs in the ruling party. I pray for the day when Mr Lungu will genuinely denounce violence in our country. It seems his party is using violence to intimidate voters for the opposition. This is a very dangerous state of affairs. May God punish all those promoting violence and untruths. May they be cursed together with their families for generations to come. Western province again? Iwe mwaice Trib.al Hacks, you did not give way again? So you want another stint in mukobeko and start the dialogue over?? Waste of time uyu umwaice, trib.al yacilamo. @Sad patriot:BACK TO THE SENDER!! !For your own data,it is actually your HH who is evil.Kainde’s ways of doing politics are that of a SATAN! !HH KNEW HOW SMALL SESHEKE IS AND THAT ECL WILL BE CAMPAIGNING THERE TODAY FOR ONLY 1 DAY,WHY DIDNT HE WAIT AND GO THERE TOMORROW?Whether you like it or not,ZP have to protect the president at all cost.SO FOR ZP,IT IS ECL (CURRENT PRESIDENT FIRST) THEN ALL OF US SECOND!! !Many lives were going to be lost if ZP allowed PF and UPND camps to meet in a small Sesheke town.SO PLEASE DONT THINK USING YOUR TRIBE,BE REAL! !HH was 100% wrong by going to Sesheke for campaigns today.IN LIFE SUCH SITUTIONS CAN BE AVOIDED FOR THE SAKE OF PEACE!! BUT BRO NJIMBU, UPND-CADRE IS SAYING EXACTLY WHAT YOU’RE SAYING! ……… an avenger to execute wrath on him who practices evil. Now UPND has resorted to using JUJU in Sesheke out of their desperation to defend this seat but you are quiet.Is that normal sure?Lightening is killing PF members and now bees attacted PF members today-AMAZING STUFF! !Believe you me,if not controlled,UPND’s desperation for power could set Zambia on fire especially in 2021(God forbid) as it will be HH’s 6th and last attempt to rule Zambia!! THE FACT IS BOTH PF AND UPND HAVE VIOLENT CADRES!! !Plus while ECL blames violent PF cadres,HH never does that to his UPND cadres-WE HAVE EYES SO WE SEE BWANA! !Learn to call a spade,a spade!!! Thanks a lot prophet “Ndeloleshyafye” for educating sinners camped UPND who support HH blindly!! Truth be told,HH has no respect for president Edgar Lungu or for the office of the president.BUT THAT IS HH’S PROBLEM! !Hence,he must not involve ZP in his battles with those in Authority! !HH needs to know that there can only be one president in Zambia for 5 years.Even himself(HH) in state house,he would expect all Zambians to respect him and ZP to protect him-simple! !PATIENCE PAYS BO KAINDE WHILE SPEED KILLS BADALA,SO RELAX!! Let’s not be children. Let’s not pretend not to see the typical behaviour of Zambia’s opposition. PROVOCATION, disrespect to police, endangering ordinary UPND members. This party should be banned. Also this is Western province, their enclave. Violence, Tribal …………SAD, Zambia has become split like this. Again HH was punk-ing the President, being in the area and causing rioting. What’s new here? Patriot Abroad you are the people misguiding ECL, little does he know he is committing war crimes. Remember Chiluba was persecuted for just extravagant shoe shopping now this. Firing live bullets on defenseless innocent citizens. This is no different from what Mnangagwa was doing recently. UPND needs to put those videos out there for the world to see ECL’s brutality so he can be humbled and forced to call for dialogue like his counterpart in Zimbabwe. There is no defense for such kind of behavior, this man needs to go so people can have their freedom back. I pray Father God intervenes before he takes a lot of human lives. Patriot Abroad, you should be ashamed to support such barbaric behavior. This is no different from what Mnangagwa did in Zimbabwe recently, He was condemned and now he is crying for dialogue with the opposition. UPND needs to put this out to the whole world to see and not just for ZNBC watching cadres who are busy disputing despite electronic evidence all over social media. ECL needs to go so people can have their freedom back, there is no way we can develop with such a dictator at the helm of power. I pray father God intervenes before this crazy power hungry man takes too many innocent lives. Don’t call on the name of God in vain. UPND is a party of provocation, it’s the fact. It’s tribal, fact. The police have to do their job to protect all citizens even the President. Politics of antagonism put innocent ignorant people in harms way. You conduct an illegal rally in an area where the Head of State is, is nothing more than outright provocation to get publicity. When police take action innocent people can end up dead. Let’s not defend wrong doing by condoning provocation then getting publicity for violence through filming police intervention. The police are on order to protect the head of state. Very tough men the police and thugs when they are the only ones with guns in their hands. I am sure they would not feel so high and mighty if they knew there was a good chance of retalorItty fire coming their way. Respect for others eebuntu. Presidency must be respected at all times. Just because some one invited you to a mining symposium does not mean you went to represent Chambia as kateka, awee badala. Grow up with time. Backward politics are long gone. Being an alarmist does not help at all. Look here the world is watching and just saying Chambia has no alternative; at least not now. Pf supporters are most *****s and stupid because they can not differeciant between good and bad.A person who came from a normal sperm can not support pf what they are doing unless otherwise.let us condemn these parties were they have gone wrong than defending them. 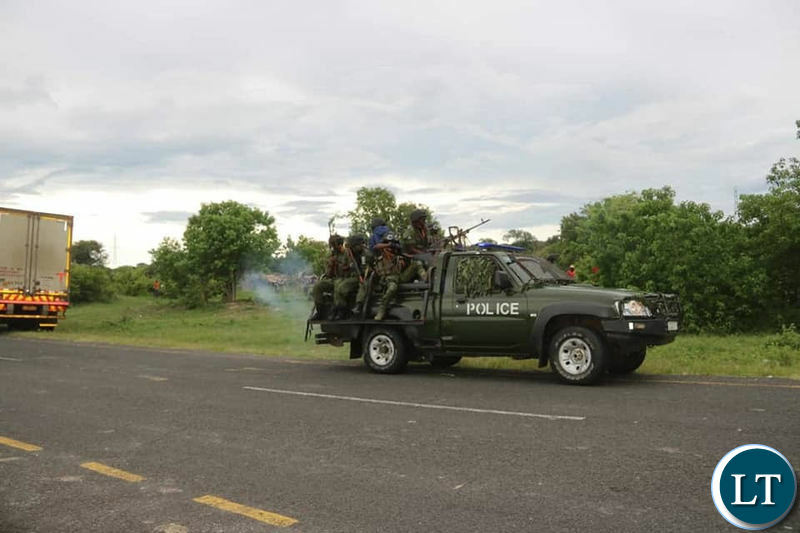 ZAMBIA THE NEW ZIMBABWE WHERE CITIZENS ARE BEING ATTACKED BY THE VERY PEOPLE THAT SHOULD BE PROTECTING THEM !!!!!!!! 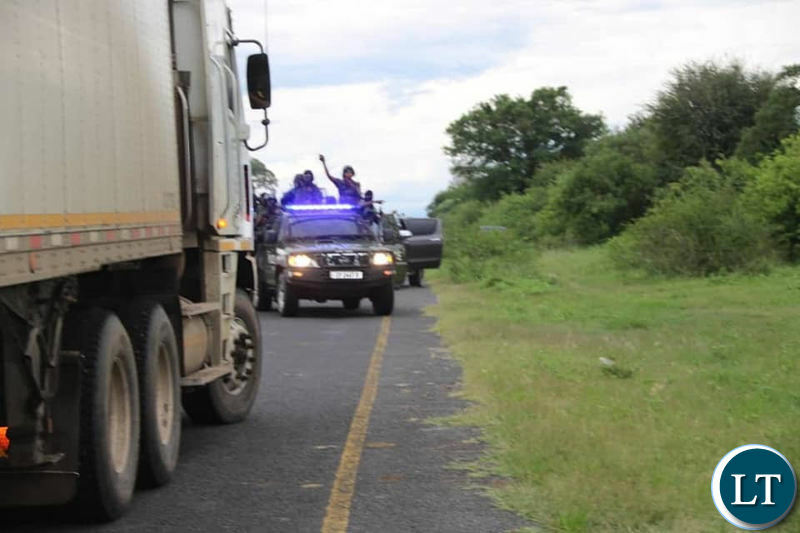 PF WE WILL NOT ALLOW YOU TO TO USE MILITARY AGAINST US ! IS THIS WHY YOU ARE BUILDING ARMY BARRACKS ALL OVER THE SOUTHERN AND WESTERN PROVINCE – TO CRUCH ANYONE THAT VOTES AGAINST YOU IN ELECTIONS !!!!!!!!!!!!!!!!!!!! Hh please stop your lies..!!! Us in sesheke knew what you were up to. You just wanted to embarass the President like you did at kuomboka in mongu. Why didnt you wait for the president to leave sesheke? Sesheke is your stronghold but right now we are disappointed with your behaviour. Dont be surprised if your candidate loses. Utuhele buhata..!!! Problem is that Mr HH thinks he’s a president and as such he’ll challenge every regulation. MAYBE BOTH SIDES SHOULD BE BLAMED. THE POLICE SHOULD UNDERSTAND THAT DURING ELECTIONS PEOPLE BECOME VERY SENSITIVE AND SUSPICIOUS OF EVERYTHING. SOMETIMES LOOKING FOR EXCUSES TO USE ONCE THEY LOSE. DO YOU REALLY HAVE TO BUST THE UPND CAMP LIKE THAT IN MILITARY-STYLE LIGALIA WEIRDING AK-47s AS IF YOU ARE GOING TO WAR? THESE ARE JUST POOR, UNARMED PEASANT SHEPHERDS AND PASTURERISTS. THE POLICE SHOULD EXERCISE RESTRAINT. ON THE OTHER HAND THE UPND SHOULD LEARN TO OBSERVE ORDER. THEY SHOULD NOT HOLD ILLEGAL GATHERINGS AND AVOID DARING THE POLICE. My brother Mina, you want more lightning and bees to be released on who? People, why don’t we love each other? Those who live by the gun, die the gun! This karmic principle has been proven many times over across the world and Zambia is no exception. If a government wants to kill someone it can do so easily. It happens everywhere in the world. Latest is the Kasshoggi murder. HH shouldn’t try to be like a movie hero that miraculously escape unhurt in tight situations. Much more political wise have been killed and the murder never solved. Please HH just obey the law. What’s happening there. ..without bias….Upnd have developed a system of surfacing at other parties venues especially at PF meetings. HH thinks because he’s HH police will let him disrupt other people’s programs. Cry baby tactics have not worked in the past and they will not work now. HH will not be killed by any one, may be his own thugs. 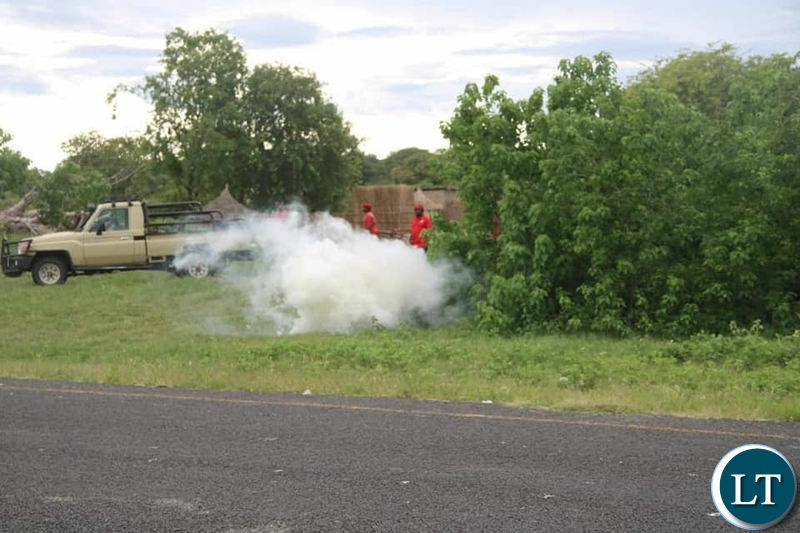 What were those UPND thugs doing in the bush? Surely the worst thing that Zambia has ever had since the advent of plural politics is the sinful entry of HH through the back door into a once fair, democratic zambian political party. Harassing people because they belong to a particular party or tribe is a recipe for disaster. Please let’s help maintain peace in our loving country and not fuel hate and violence by careless comments on this forum. Sounds like comedy. Live bullets fired at a crowd and no one is injured. What is there for UPND to be scared of if the police can miss even one in a crowd? How can police come from “nowhere” in such a place without UPND security staff knowing? Police, kill this boy, he has never tasted death so give it to him. This is a DIRECTIVE from me. Indeed what to you expect from Hakainde Hichilema Mazoka whose father Anderson Mazoka stole Late President of DRC (Zaire)’s cattle that was in transit from RSA to Zaire. This resulted in him fired from Zambia Railways by former President Kaunda. Furthermore…a man whose source of his wealth was facilitated by his father..who after taking over from the late David Phiri at Anglo America corp. started selling (plundering) the corporation’s assets and initiated his son Hakainde into the Freemason. Before that Hakainde was a broke man working for a firm that was even battling to pay salaries at their firm ( Coopers and Leybrand).